I like to think of this as a Japanese grandma’s version of chicken soup: the perfect cure to whatever ails you, be it the sniffles or a stressful day. As is, this soup is vegetarian, but feel free to change things up based on your mood. Swap chicken or beef stock for the vegetable. Stir in smoked brisket, pulled pork, shredded chicken, or tofu cubes. what I love even more than the versatility of this soup is that it can be made in less than 30 minutes. Bring stock, miso paste, garlic, and ginger to a simmer in a medium saucepan over medium heat. Simmer 5 minutes. While stock comes to a simmer, cook eggs. Bring a medium saucepan of water to a boil. Add eggs and cook 6 minutes. Immediately plunge in ice water to stop cooking. Peel eggs, carefully cut in half, and set aside. Add noodles, bok choy, and mushrooms to simmering stock and cook 3 to 5 minutes (or according to noodle package directions). Divide soup evenly between bowls. Top with egg halves and garnish with desired toppings. When we lived in Fort Pierce, there was an awesome taco restaurant, Antojitos Mexicanos, that served up THE best authentic tacos. The corn tortillas were made fresh, the meat simmered for hours, and the homemade salsa (green or red) came hot or hotter. 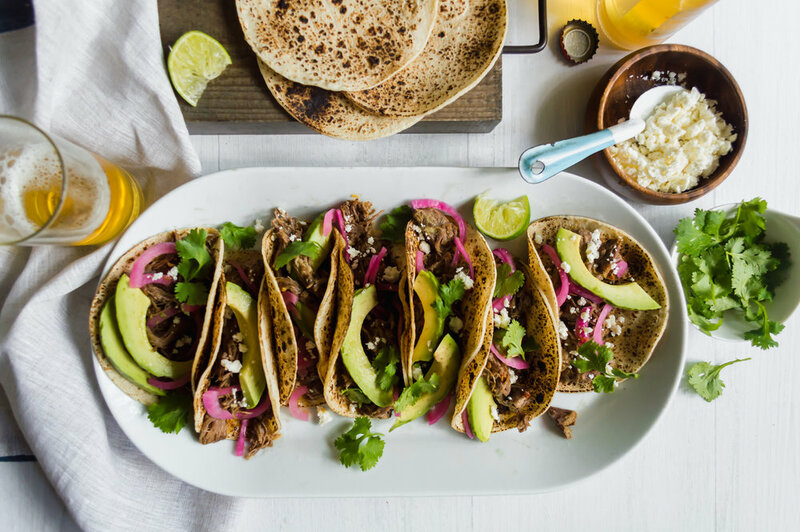 I typically ordered the barbacoa or carnitas tacos, and this recipe is my take on the former. The best part about this recipe? You can make the beef in the Instant Pot. Don’t have an Instant Pot? That’s okay. I’ve also provided instructions on how to make it in a slow cooker. Top these babies with Pickled Red Onions (see my previous post or use sliced red onion if you’d rather), crumbled cotija cheese, fresh cilantro, avocado, and a squeeze of lime, and you’ve got yourself a taco party. In a 6-qt. Instant Pot, turn to the Sauté setting and heat until hot. Cut the beef into large pieces. Add oil to the Instant pot, and brown beef, in batches, on all sides. Remove from pot. Meanwhile, combine the beef broth, vinegar, lime juice, garlic, chipotle peppers, adobo sauce, cumin, oregano, salt, and pepper. Add to the drippings in the pot, and stir with a wooden spoon, breaking up any browned bits on the bottom. Return the beef to the cooker and add the bay leaves. Secure the lid, and turn to the Manual setting at High Pressure. Set the timer for 1 hour, and 15 minutes. Use the Quick Release method after the beef is done. Remove and discard the bay leaves. Shred the meat with two forks. Char the tortillas using a gas burner, or warm them. To serve, divide the meat evenly between the tortillas and top with desired toppings. To Make in a Slow Cooker: Brown the beef in hot oil in a large Dutch oven or skillet; deglaze with the beef broth mixture. Transfer the beef, beef broth mixture, and bay leaves to a 6-qt. slow cooker. Cover and cook on LOW 8 to 10 hours, or until the beef is tender. We had snow week before last. In Charleston... South Carolina. Close to 6 inches, no less. To most, half a foot of snow is nothing but about a month ago, we moved here from South Florida. "Winter" for the past 5 years has involved one week of temperatures in the low 60s, so the below-freezing temps were a shock to my system. All I wanted to eat was soup, and I began to dream of the best soup I've ever had. This soup (or my version of it). Last summer, my family and I went to Northern Ireland, and on one particularly chilly day we ended up in a little town called Ballymoney. I'm sure you've never heard of it--we definitely hadn't--but, it was on the way to Giant's Causeway and was our best bet for lunch. So, we stopped at a cozy pub called Carmichael's. The soup of the day was Cream of Jerusalem Artichoke, and we all ordered it. I'm not sure if it was because we were all starving or because it was cold outside, but I savored every last bit of that soup. It was velvety in texture, earthy in flavor, and felt like a warm hug. I knew I was going to have figure out how to make it once we got back home, so I tried to remember every detail of it. Fast forward to a few weeks ago, just before Christmas, and a first visit to our new-to-us Harris Teeter in our new town. I was perusing the produce department when the heavens broke into song and there they were: bags of Jerusalem artichokes for sale. Because I had never seen them in the grocery store before (we had just moved from a small town), I immediately grabbed every single bag. I was going to figure out how to make that soup. After a few tries, I think the result is pretty close to the soup from Ballymoney. You can easily cut the recipe in half. The soup is rich, and this recipe can easily feed 8 to 10. I made a larger batch because 1.) I bought the remaining 4 lbs they had for fear I would have to wait until this time next year to have them again and 2.) Leftovers are loved at my house. If you haven't seen Jerusalem artichokes (also known as sunchokes) before, they look like ginger root. If they are very fresh, you can actually peel them like ginger: with the edges of a spoon. I found that it was easier to use a paring knife. After you've peeled the Jerusalem artichokes, cut them into small chunks, dice the celery and onion, and mince the garlic. Sauté the onion, celery, and garlic in hot olive oil until tender, then add the Jerusalem artichokes. Simmer for 45 minutes in broth to cover, and then purée with an immersion blender. Add heavy cream and a little dry sherry and season with salt and pepper to taste. Simmer for about 5 more minutes, and voila! The best soup you will ever have. Heat oil in a Dutch oven over medium heat. Add onion, celery, and garlic. Sauté 5 minutes or until vegetables are tender. Add Jerusalem artichokes and broth. Bring to a boil; reduce heat to medium-low, and simmer 45 minutes or until Jerusalem artichokes fall apart when pressed with the back of a spoon. Using an immersion blender, purée the soup until creamy. (Or transfer to a blender and process in batches.) Season with salt and pepper. Stir in heavy cream and sherry. Simmer 5 more minutes or until soup is thickened. Garnish servings with extra-virgin olive oil and celery leaves, if desired.